Concrete block foundation is one of the most popular types of foundations available in the US. Concrete has been in use for a long while. It became a popular material for the construction of residential homes in the 1900s because of its strength, fireproof and weatherproof properties. A concrete block foundation offers a home one of the most stable foundations available. However, it can succumb to the pressure of the water and soil that surrounds it. The high pressure exerted on the walls of the foundation results in the breaking down and wearing away of the mortar used to join the blocks of the foundation. Water is therefore able to seep through the spaces and cracks leading to water seepage. Concrete is a porous material. It therefore absorbs moisture in time. This can lead to a mold or mildew problem. There are some instances where the pressure on the wall from the soil and water is so great that it causes the concrete block wall to bow inward. If this problem is not corrected in good time, it can cause the wall to collapse. It is important to ensure that a concrete block foundation has adequate waterproofing during the construction phase. 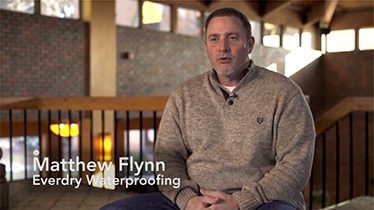 If you are experiencing waterproofing problems with your home’s foundation, there are various solutions available to help correct the problem. There are two approaches to dealing with waterproofing of this type of foundation. This involves applying a waterproofing solution from the exterior of the foundation walls. This approach involves little destruction of the interior of the home. It however costs much more as it is labor intensive. The solutions applied will depend on the extent of damage observed. The contractorexcavates the foundation and installs a waterproof membrane to the exterior of the foundation walls. Next is the addition of drain tiles to collect and drain any excess water that may collect near the foundation. This method of waterproofing aims to stop the water from the inside. It involves the installation of an interior drain tile that directs the water along the drainage system installed below the floor and drained into a collection well. A sump pump then pumps the water out. The bottom row of blocks in the basement is drilled forming weep holes that allow water to drain out and into the drainage system.